This article is addressed to those users who are unfamiliar with Word security model and would like to know more about Word passwords. Three different types of passwords could be found in Word documents. To prevent unauthorized users from opening a document at all, you can assign this type of password. Users who don't know the password cannot open your document. You have to enter the password and open your document or open your document in read-only mode. By-the-way, you can open the document in read-only mode, remove password to modify it and perform "Save As" menu command. Then delete original Word document and rename saved document: it is now unprotected. 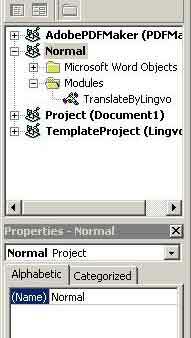 Word document can include VBA modules (VBA stands for Visual Basic for Applications) with macros in it. VBA modules can be protected by password too. 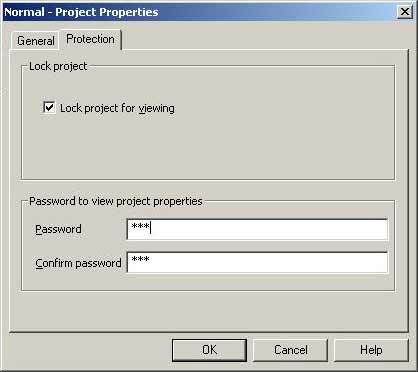 To assign VBA password click right mouse button on the project and choose Protection tab on the Properties menu (see the following screenshots). Read the following articles to know more about "fake password", brute force attack, smart force attack, dictionary search attack, express recovery, guaranteed recovery. Read the article about all available password recovery methods here. 1) Word2.0, Word 6.0 and Word 95 have weak and unreliable protection. Password could be recovered immediately. Document must contain enough text inside (at least one page) to allow password recovery (because it is based on statistical methods). If there is not enough text in your document Word Password may fail to recover the password. 2) Word 97 and Word 2000 has improved password protection. There are two ways to recover Word password in this case. The first one is to search all of the password variants (brute force or smart force attack) or dictionary search. This method has good results in case of short password, but you can't recover long and complex password using this way. In case of complex and long password it is better to use Express password recovery. Express password recovery is a unique recovery method that guarantees successful password recovery regardless of password length. Note that Express Recovery is applicable for passwords to open only. You can use Express Recovery to recover Office XP documents if only they were saved in default (Office 97/2000 compatible) encryption mode. If a document has been saved in advanced encryption mode, Express Recovery will not work. 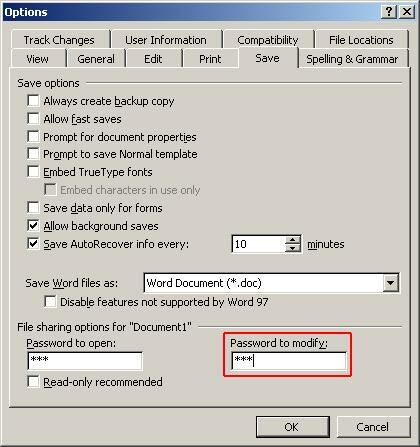 3) Word 2002 (XP), 2003 has opportunity to choose encryption mode - weak protection as in old versions, standard (used by default) as in Word 97/2000 and several advanced encryption modes. Express recovery doesn't work with advanced encryption modes. File password protected in the advanced mode can not be opened in the previous Word versions. Special note. French versions of Word (any version) have weak protection (the same as Word 2.0/ 6.0/95). This is because of French law that does not allow encryption. Attention! If you protect your document with several passwords and one of them is password to open first you have to recover password to open and then recover other passwords. 4) Passwords to open are extremely hard to break in Word 2007/2010. 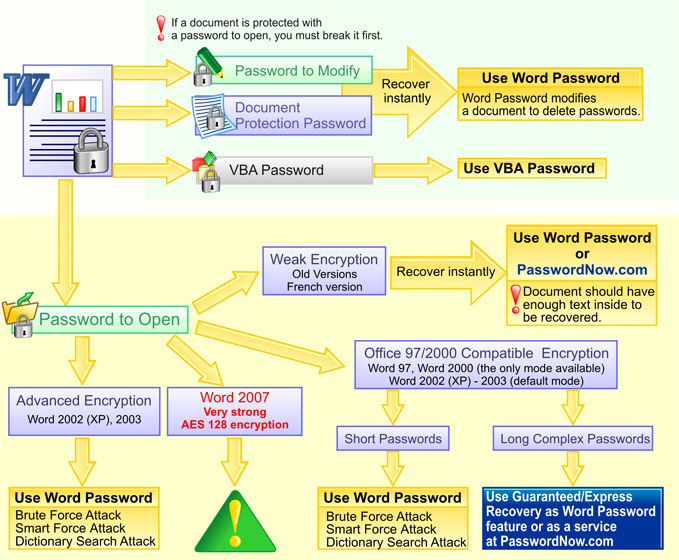 You can find more information about password recovery for Word 2007 and Word 2010 here. It's not possible to recover these passwords but our program Word Password can modify document to delete the passwords. Note. Word Password is not able to recover (crack) VBA passwords. There is a special program to crack VBA passwords - VBA Password. If you have two passwords in your document - VBA password and any type of Word password and forgot both of them you need two modules to recover passwords - VBA Password module and Word Password module.